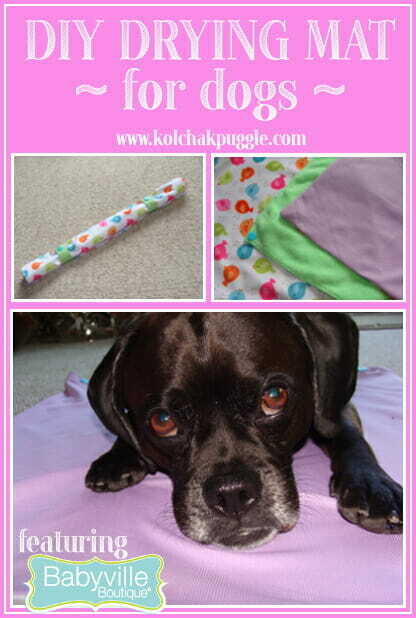 This post is sponsored by Babyville Boutique, offering specialty fabrics for sewing for the special people (or dogs) in your life. While we were compensated for this post, all opinions are our own. 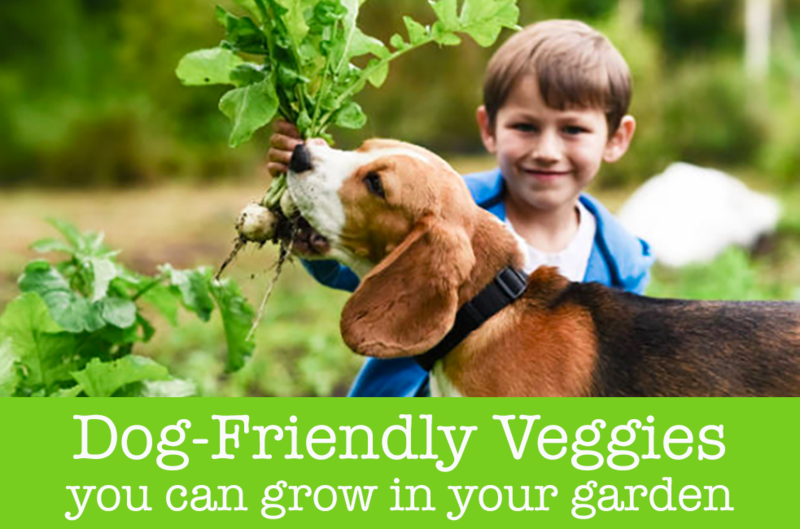 If you’re lucky, you and your dogs go on lots of adventures in the summer. Swimming at beach, playing at muddy parks, and getting caught in summer showers are just part of the fun, but no one wants a wet dog getting back in their car or hanging around in the house. If you have a fluffy dog like I do, your dog can stay damp for hours, even after you’ve towelled them off. 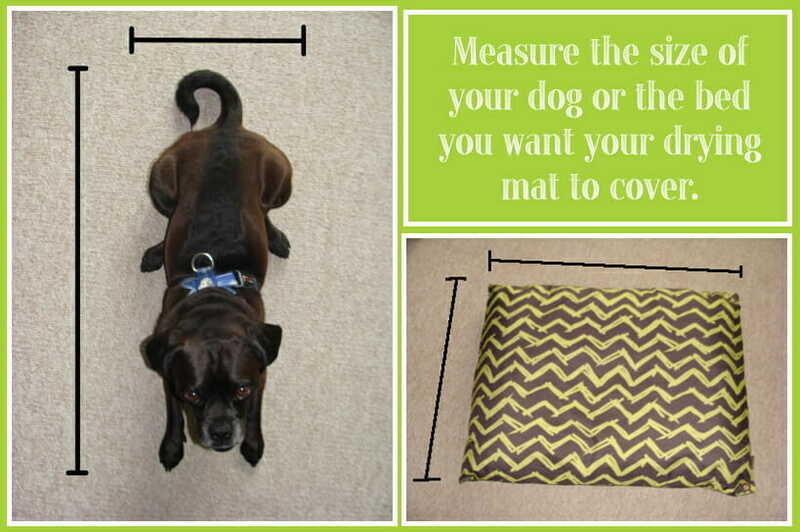 Our DIY drying mat for dogs is a great way to soak the excess moisture off your dog and it gives your dog a spot to lay down protecting your upholstery and floors from wet dog. There are days when I swear Felix is made of sponge. Once that Fluffball gets wet, he stays wet…for hours. When we’re on the go, like at friends, the lake house or in the car, I don’t really want a wet dog hanging around on the upholstery, laying on the woods floors or making a mess of the car. Towels don’t do much to help, since the moisture just soaks through. I hate it, especially when we’re not at our own house. Nothing says “thanks for having us over” like letting your wet dog and wet dog smell soak into their house. Imagine my surprise, when I discovered wet dog solution, inspired by cloth baby diapers. Luckily, Babyville Boutique sent me everything I needed to create the perfect DIY Drying Mat for Dogs. 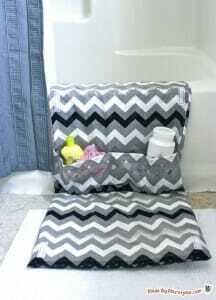 Babyville Boutique makes this great line of fabrics that are designed for making cloth diapers. If you have small dogs, they make these great little pre-packs of fabric, but for larger dogs, it’s also available on bolts at places like Jo-Ann’s and other fabric stores. The Babyville Boutique Waterproof PUL fabric is a bright solid or fun patterned fabric on one side and a laminated material on the reverse. I decided to use it as the bottom layer of my drying mat. Felix loves to come in SOAKING wet and head straight for the couch. With the Babyville PUL Fabric, I’ll be able to toss his drying mat on the couch and know it’s being protected from all that water. The Babyville Boutique Stay-Dri Wicking fabric is designed to draw moisture away from the surface . 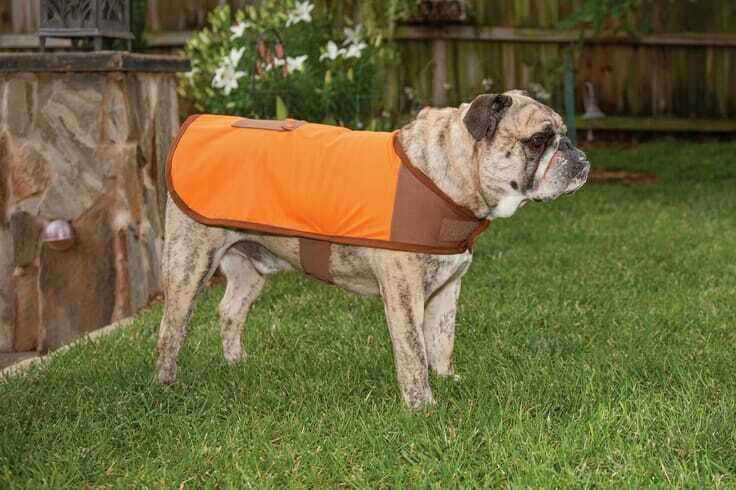 It’s the perfect choice for a dog who stays wet long after you’re done swimming or in the rain because it will help get them dry faster. I headed over to my local fabric store to find the perfect absorbent layer. Traditionally, cloth diapers use a cotton or bamboo layer, but I decided to go with my own personal favourite – microfiber. The great thing about microfiber is that it can absorb up to 8x its weight in water, making it a great choice for your soggy dog. Since the rainy season here is long and we’ll likely use our Drying Mat multiple times per day, I decide to make it so the absorbent layer could snap in and out, replacing it with a dry layer as necessary. I was a little daunted by the idea of using snaps, since I’ve never worked with them before, but Babyville Boutique Snaps were so easy to use and it took way less pressure than I expected to set them. Even with my stupid carpal tunnel flaring up in my right hand, I was able to easily work the snap pliers. Do you want to protect your floors, furniture and car with a waterproof drying mat for your dog? It’s SO EASY. This basic sewing project is great for beginners, since it only takes a few simple seams. Kitchen-weight microfiber cloth, preshrunk, if possible. You can even make this to go on the seat of your car. Once you know what size you want the mat to be, make sure that you add 2″ to the width and 5″ to the length for seam allowance. After ironing, cut 1 piece of the Waterproof PUL fabric and 1 piece of the Say-Dry Wicking fabric to your desired size. When you’re sewing, you always want to sew with the plain sides of your fabric out, so match up the fabric side of the PUL and the textured size of the Wicking fabric. If you plan to take your mat on the road, it’s super handy to be able to roll it up and snap it in place, so I cut 2 – 6″ pieces of the Babyville Boutique Foldover Elastic, hemmed one end to finish it and set the unfinished ends into the seam on one of my long edges. Use a pin or two to hold the elastic in place until you’ve sewn it in. Place pins every few inches along the outside of your fabric. The PUL is fairly heavy and the Wicking fabric is pretty light, so the pins are important to help keep your fabric together while you sew. I found that for best results, go slow and keep the PUL fabric taut as you sew. Now that your mat is sewn on three sides, you want to hem the open end to give it a nice finished look. Fold over 1″ of fabric and then fold over again. Pin your hem in place. I decided to iron mine to get a nice, crisp hem edge. If you do this, take care to only iron the fabric side of the PUL and not to touch the laminate side with the iron. 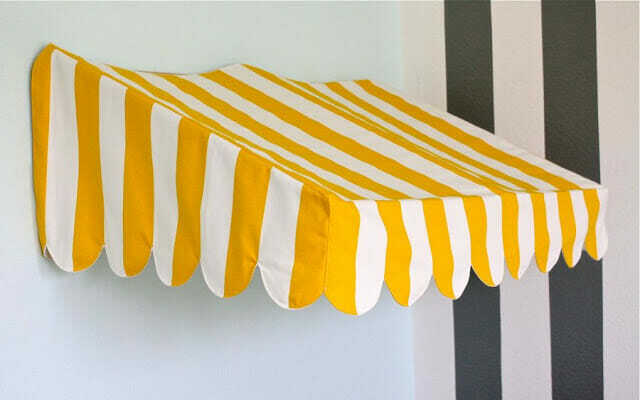 Alternatively, if you want something a bit more decorative, you could cover your unhemmed edge with the Babyville Foldover elastic or the Babyville Ruffled elastic. Once you’ve finished the hem, set the cover aside. Now it’s time to make your microfiber layer. Once your microfibre has been shrunk, cut a piece the same size you measured in step one (before you added the seam allowances. Fold over the edges, pin in place and hem all four sides to prevent fraying in the washer & dryer. (If you have a serger, you can cut this piece 1/2′ smaller on all sides and serge the edge. So easy!) You can make as few or as many of these microfiber layers as you like. I would like to have a bout a million, but I settled for five. Snaps will help keep the hemmed edge of your Drying Mat cover from popping open and it will allow you to snap the microfiber layer in place to keep it from bunching up and moving around. Turn your drying mat cover right side out. 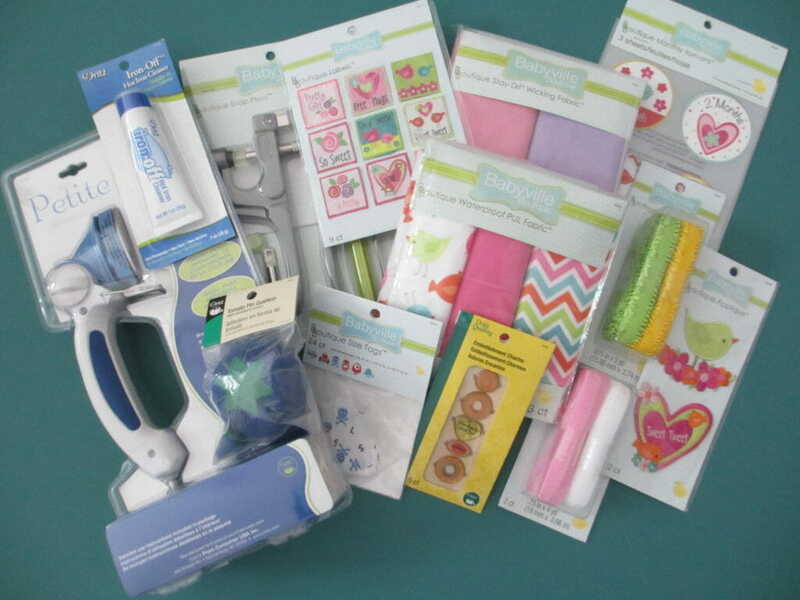 The Babyville Boutique Snaps and pliers were super easy to use and the pliers set comes with everything you need. 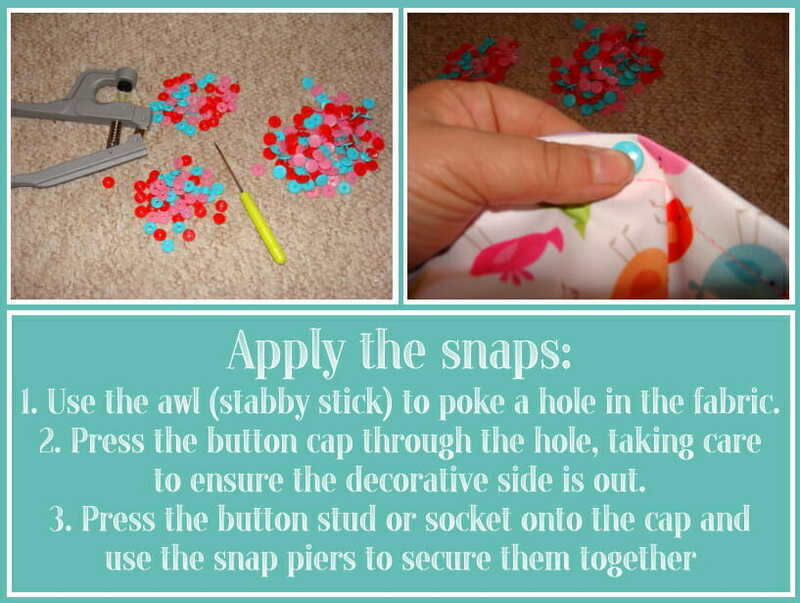 Simply use the awl (provided with the set) to poke a hole in the fabric, insert a button cap into the whole, place a button stud or a socket onto the cap and press together with the pliers. Lay your microfiber layer on top of your cover and use the awl to put a hole through both the microfiber and the PUL Layer. Place a snap through the PUL layer only. For added strength, cut a small piece of PUL, puncture it with the awl and place it on the button cap before you put the socket on. Make sure you place the button cap on the outside of your cover and the socket to the inside of the cover. Use the pliers to set the snap. Place a snap on the corner of your microfiber cloth, with the stud to the top and set with the pliers. Repeat for each corner. Snap the microfiber layer inside your drying mat cover, between the PUL and Stay-Dri Wicking layers. Snap the hemmed edge shut. Add snaps to the elastic, so that you can snap it in place and keep it from unrolling. 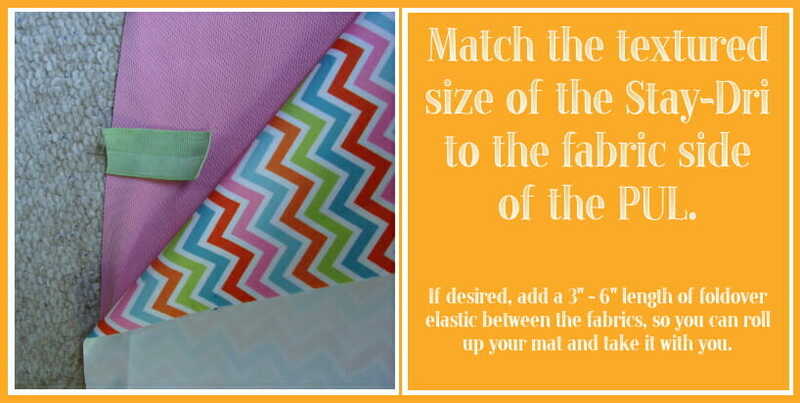 It’s easiest if you roll your mat up, wrap the elastic around until it overlaps and then use the awl to puncture both layers of elastic at the same time. This will ensure that your holes line up. Makes sure that you are careful to match a socket snap on one side of the elastic with a stud snap on the other side. You can set the holes left by your pins and the sewing needles by tossing your mat cover in the dryer for 20 minutes. This will heat up the Waterproof PUL just enough to make sure every hole seals and the whole thing is water tight! 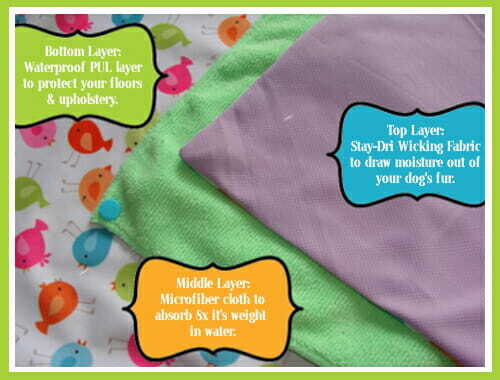 This handy DIY Drying Mat for Dogs is ready to pack up and hit the road! Whether you’re using it to protect your seat after a swim at the lake, as a mat to for wet dogs to lay on while you’re visiting friends or just around your own house to minimize clean up and soggy, wet messes, the drying mat has already made my life so much easier. It’s great to just pull out the microfiber layer when it’s wet and replace it with a fresh one. Everything is washable, so you can just toss the whole thing in the machine when you need to and I feel like less of a jerk when we show up at the lake house soggy wet and ready to leave wet dog smudges all over the nice clean floors. Check out some other cool ways you can use Babyville boutique fabrics and for your chance to win a prize pack full of everything you need to sew a great Babyville Boutique project of your own! Click on any link below to learn more about Babyville Boutique and their products. 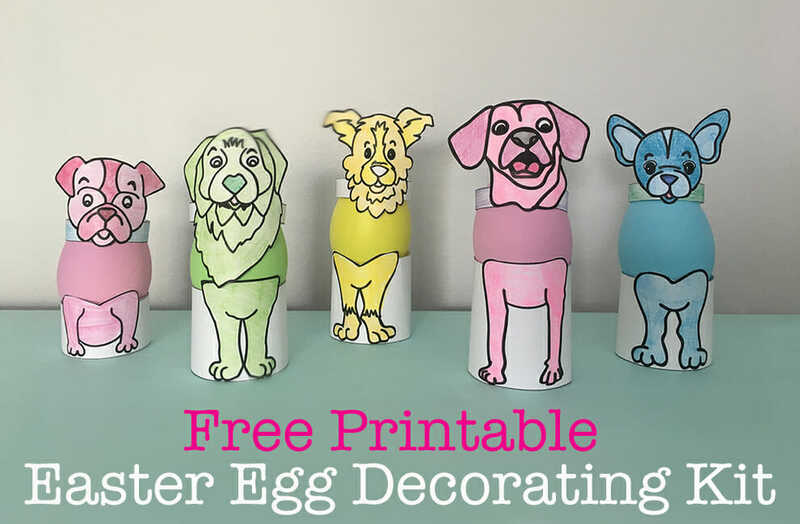 Do you want to to win a prize pack from Babyville Boutique, so you can make something special for your dog (or baby, if you happen to have one of those)? Enter now! I’m pretty sure that is what dog-Grandmas are for. Good luck! 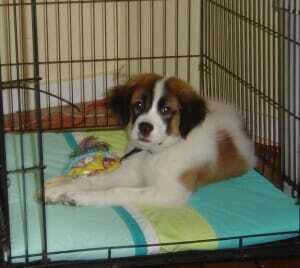 I would make the pad for my puppy’s kennel. What a great idea and giveaway! This would be so great for a puppy. Good luck! Seriously, your hubby is dreamboat. Is there anything he CAN’T do? This is a great project for people traveling with pets! It makes me wish I had a sewing machine in the RV. You probably know someone who could be persuaded to sew one…probably. I really could use a kneeler for the tub! Right? Forget bathing the dog, I even want it for cleaning. Um wow, this is so creative! Such a brilliant idea. My dog dries quickly, but it would be nice to have something like this for her after a bath. She tries to lay in all the places I don’t want her to. Thank you Ann! I’m loving how much easier it’s making things. Dogs seems to have a sixth sense for knowing exactly where we don’t want their wet bodies, don’t they? This is brilliant! I’ll be making one for each of my fur babies so they can lie on their beds after their baths when they’re not completely dry. If I was making it to slip over a bed, I might consider making the elastic long enough to wrap all the way around the bed, so it snaps in place, just so it doesn’t shift around. Good luck! I would love to make my own Drying Mat. Awww! Aren’t you so sweet, thank you for that lovely compliment! I’d love to try my hand at the drying mat! You really amaze me with your creativity. You really do. Awwww thank you Jodi. I’m so glad that Babyville Boutique contacted me because I don’t know if this would have occurred to me without their gentle nudge. Gee, I love all the ideas and I love to sew. I think I’d start with the drying mat, but I’d like to make the dog coat for a couple of my dogs, too. 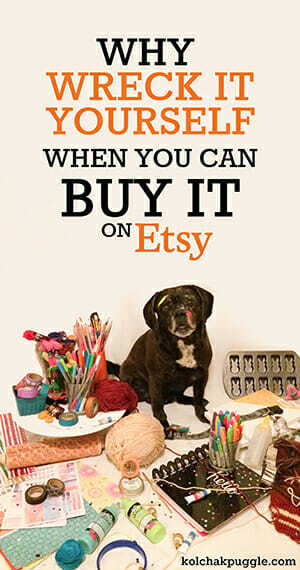 You know my DIY DOG Pinterest board is dominated by your posts, right? 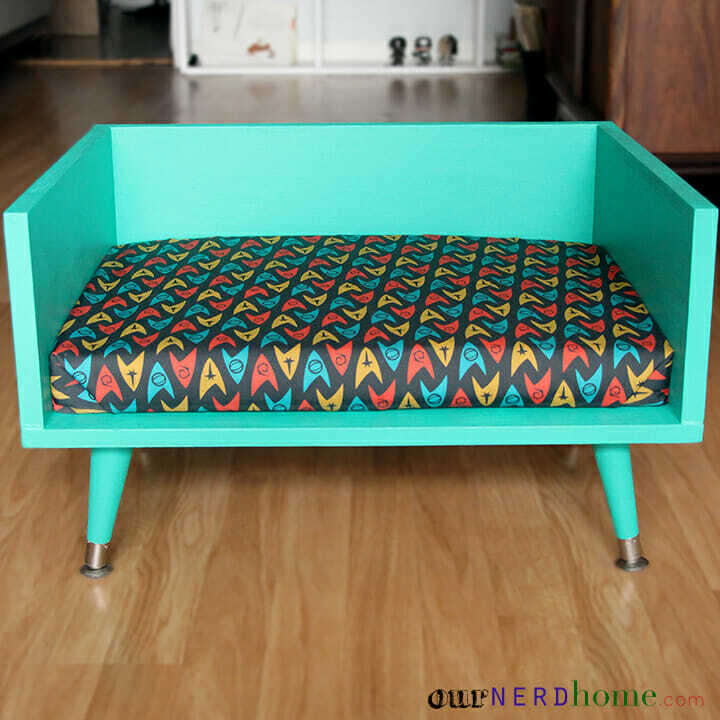 I love these DIY Dog projects! Thank you! We had fun making ours and discovering other fun ways to use the Babyville fabrics. Love, love, LOVE! Pinning this immediately. 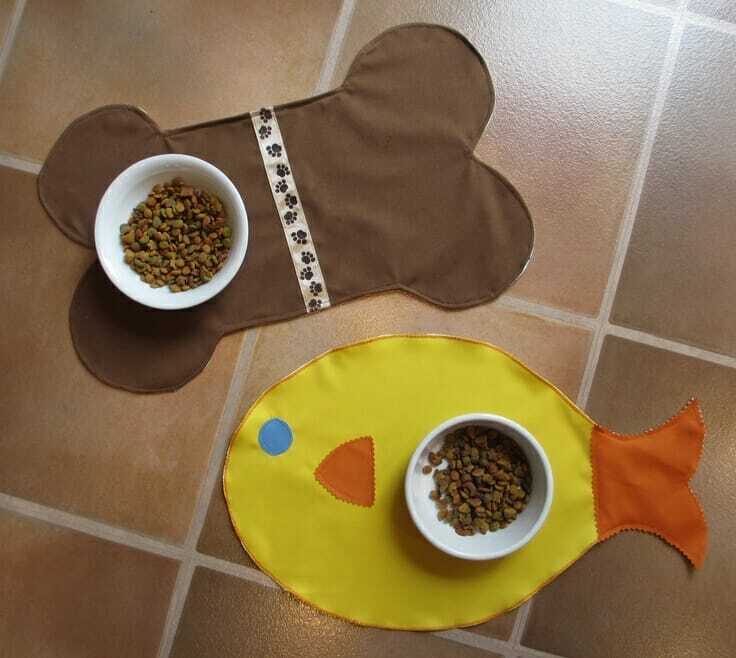 I think I’d make the pet placemats. They are way too cute! I have a friend who used these for diapers and they are super cute. I love the bath mat! I’m not sure what I would make, so many options! These projects are only the tip of the iceberg! Next week I’m sharing a cool project that I made for the deck. I would make a pad for the car. Dog loves swimming and car rides! My Mom wants me to make a big one for the car. Apparently wet dog smell isn’t her fav. Weird right? That is a great idea. My dog is massive so drying him is a struggle because he over powers me. And babyville boutique is the best! OOhhhhh, we would make pads for car rides, lap pads for Delia’s grandma and cousin and soooo many ideas. Wow! Awesome idea! This looks super useful if you’re just a little bit handy. Brilliant, i think Bob will be getting one of these! I plan to make a car seat pad to go in my daughters car seat during potty training and also some waterproof trainers! Awesome!!! I would love to make the drying mat for our Great Dane. So cute! With 4 rescued furbabies I can use all the drying mats I can get and then some! I know. Some days I wish I could slipcover my house in one big drying mat. Awesome projects! I am torn between the drying mat and the waterproof crate pad. I have ten Rescue dogs and seven of them are seniors. Thank you! Wow! What a houseful. Sounds like you have an amazing pack. I’m kind of dying to try the coats and come fall, I probably will! I would make a drying mat for my grandcat. I would like to make stuff for my baby–maybe a wet bag with a dry pocket that the whole family could use! Ohhhhh, I like that Idea! I could use one of those for after we play in the puddles at the park! I don’t have a dog, but this is a neat idea! I love babyville stuff, I use it for diapers. Id like to make a washable and wipable bag for my nursing gear! Although this dog mat would be perfect I would love to make some diapers! I would love to make some diapers too lol! I would make a cat teepee or something silly for him. Ohmiwoof, that would be SO CUTE. I would LOVE to see that. have a niece that was just born today so perhaps something for her. I need to make the crate liner for my on the go crate. I also would like to make a drying mat because Artie loves water and he is another dog that is part sponge-an 80 lb one!! 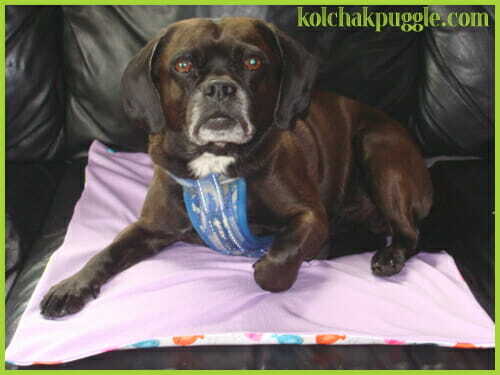 I would love to make the drying mat for my Patchouli the Puggle. I would use it as a comfortable cushion for her to sit on in shopping carts, and in the car. It would go everywhere with me in my dog bag. This would be so perfect.